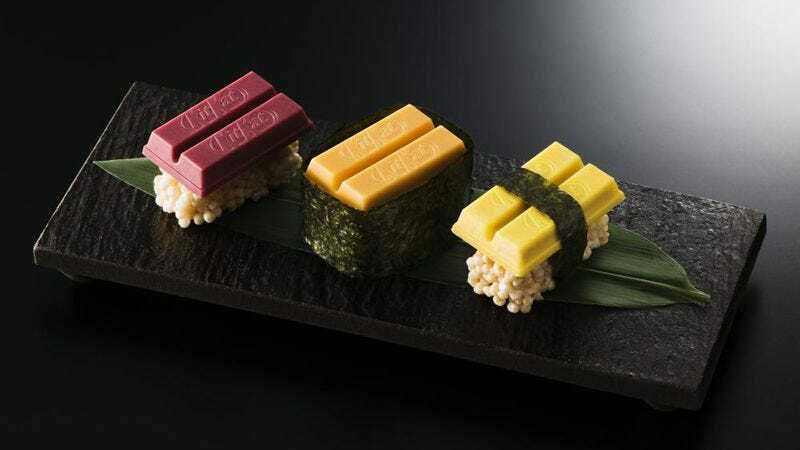 Japan’s love for the Kit Kat is well-documented at this point, as is the country’s fondness for “weird” Kit Kat flavors like “wasabi,” “green tea,” and “Super Dimension Fortress Macross.” Today, though, a newly opened Kit Kat shop is offering the fanciest specialty flavor yet: Kit Kat sushi. The set of sushi Kit Kats costs around $26, but even if you have a few thousand yen burning a hole in your pocket and you happen to be in Tokyo, you’ll only have until February 4 to get some. After that, they’ll all be scattered to the far corners of the Earth like the Dragon Balls, only to return when a great hero needs Kit Kat sushi to save the universe.